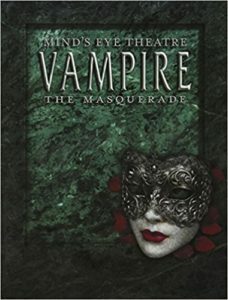 Welcome to the Atlanta Interactive Theatre website, the Southeast’s longest running Vampire the Masquerade based LARP. We are now celebrating Twenty-Four years of continuous storytelling! Atlanta Interactive Theatre was founded in August of 1993 and has been running the same continuous chronicle and storyline ever since. In that time clans, factions, individuals, and groups have risen to glory and faded to obscurity. Volumes could be written in an attempt to cover all of the action, plotting, intrigue, and scheming of the hundreds of characters, heroes, and villains that have filled all these exciting years. During the Chronicle’s history, heroes and villains have risen and fallen, empires have been built and crumbled, and the lurkers in the darkness have pulled the strings of the Jyhad. For an overview of AIT’s long history, check out the AIT Information link above which contains our Wiki, in which we have attempted to document notable moments from every chapter of the chronicle’s storyline. AIT (Atlanta Interactive Theatre) is a Vampire based Live Action RolePlaying game (also known as a LARP). Role playing games typically involve each player taking on the role of a fictional character that they have created (or sometimes a real or dramatized historical character). The player then assumes the personality, decision-making and actions of that character. The live action element of the LARP experience allows the player to actually participate in the actions of his character rather than simply stating what the character will do and rolling some dice. The basic idea is somewhat like improvising a theatrical play with nothing but knowledge of the background and motivations of your character. Although you actually take on the role and actions of your character, there are not actually any dangerous elements to the game. All actions that would involve stunts, danger, combat and other such things have their outcomes determined by the use of a simple challenge system, similar to rolling dice. AIT is set in the World of Darkness created by White Wolf, Inc. Although many of the characters in the game are Vampires, the game is actually a story of personal horror, darkness and salvation. Storylines focus on political intrigue, moral and ethical dilemmas, mystery and the occasional combat with the forces of darkness. AIT does deal with mature themes and subject matter and all players must be 18 years of age or must be accompanied by a parent or legal guardian. Alcohol and weapons of all kinds are strictly prohibited from AIT events. You can find our FB page HERE and look for our groups for more information.